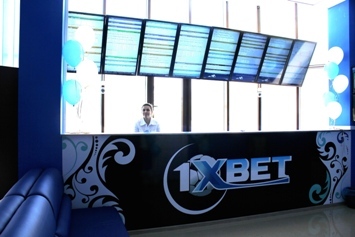 For today, 1xbet is one of the most popular betting sites in Eastern European and Russian gambling markets. Besides, in the recent years the company has expanded into West Europe. The bookmaker history began only in 2007, so it can be called a young company. Nevertheless they have become one of the leaders of this constantly changing market; the number of their registered customers has recently exceeded 500,000! A high level of service, generous sign-up bonuses, huge range of sports and endless list of markets with odds above average make 1xbet attractive for both novice and professional punters. The registration procedure on 1xbet website is extremely simple and presented in various ways: you can register an account through email, mobile phone or even with social network; there is a separate registration form for bitcoin users. You will be amazed to find a unique way to create an account in one click, easy-peasy! Just choose the country of residence and currency of the account - and you are registered! You can select any currency, and that is not an exaggeration as there are more than fifty currencies here! The bookie offers online support during registration, - enter your phone number and a consultant will call you back immediately. Of course, you will have to pass the procedure of personal data check: prove your address and age when withdrawing funds for the first time. The copy of your passport or driver's license will be enough. 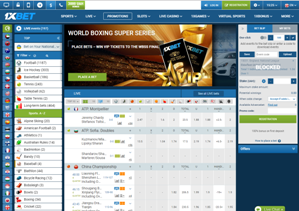 1xbet design and website interface meet all requirements. This betting site cannot be called lightning fast, but all pages are loaded quickly enough, the colour scheme does not tire out, various banners do not divert your attention. The site is available in 35 languages, which is very rare! You will find the list of all sports and tournaments in the left column; all betting markets are divided into groups so you can easily find any bet. Website navigation is simple and everything becomes clear after a few minutes. There are icons in the upper left corner that allow you to download an application on PC or mobile device with a single click; you will find an easy way to make bets via Telegram, and you can also see payment methods here. In the upper main menu you can access such sections as Sports, Live, Promotions, Slots, Live Casino, Games and 1XBonus. In addition, you can go to such sections as Lotteries, Cryptocurrency exchange, Fantasy, Hunting and Fishing, Backgammon, Forex, Results, LIVE results, Statistics, Financials, Poker, Toto, Bingo, TV Games and Virtual sports. On the main page, as usual, there is a banner with current promos, live events and the list of the most popular games of the day. It is very simple to find the needed bet - just select the sport in the left column, then the tournament and the game you need in a drop-down menu. 1xbet offers a fantastic choice of markets, the number of which can exceed thousand (for example, on a match in English Premier League). So, it is hardly surprising that it can be difficult to find a certain bet! That is why for your convenience all bet types are divided into separate parts; they are also displayed in the left column. There is a drop-down menu for each game where you can select the needed market. Another useful feature is ‘Statistics’ icon in the football match menu, where you will find not only the standings, last results of the teams and H2H, but much more - starting line-ups, the list of injuries and suspensions, interesting facts and even prediction for a game! Of course, this function is only available for top football matches. Well, it can be safely said that 1X betting site is one of the most informative in the world. The ways of deposit and withdrawal as usual depend on the country and currency. The choice of 1xbet payment methods is not just excellent, but perhaps one of the richest in the world! Unfortunately, it is simply impossible to list all the options, since this betting site offers 84 methods! You can see all the methods in detail here. We can safely say that 1xbet payment section is among the best in terms of convenience and speed of transactions. There is also a unique service - you can transfer funds to another account, your friend’s, for example. 1xbet betting markets are simply fantastic and obviously among the top 5 of the European market! To begin with, you are offered several types of betting lines! The first one is traditional to which all punters have got used. The second one is ‘Constructor’ - you can choose any two teams (or athlete) from different events (or leagues), and the bookmaker automatically creates a virtual markets on them - your task is only to guess who will perform better. In essence, you create a hypothetical meeting of two real teams, which play different real games, and the result will be based on the total number of their goals in their real matches. For example, there are two real games - Arsenal vs Everton and Liverpool vs Tottenham. You create your own betting markets and compare Arsenal with Liverpool, the bookmaker offers Liverpool to win at odds of 2.00. Both teams played their matches and Arsenal tied 1-1, while Liverpool lost 2-3. The Gunners scored 1 goal, and Merseyside scored 2. It means that the score of Arsenal vs Liverpool virtual game is 1-2, the guests have won, and so are you! Exciting, isn't it? You can also choose markets in ‘top leagues’ menu or ‘match of the day’ markets at enhanced odds. You can also bet on Exchange here. Of course, 1xbet is still far from Betfair; however, the very existence of such platform already speaks about the innovative nature of this bookmaker. Another type of betting menu is ‘Top’, which has been created simply for the convenience of players and indicates the most popular events of the day (you can choose from the top 10 to the top 50). You will find all the tournaments and sports in the traditional betting menu, and the choice of regional leagues is huge, for example, there are a dozen of English football leagues! You will never find the bookie that offers such a wide range of markets, 1XBet just got everything, including youth tournaments in the Asian championships. Be ready to see endless list of markets, for example, the number of betting markets can exceed 1000 for one game in the top football league! Since it is extremely easy to get confused among such a large number of stakes, special filters are offered, thanks to which, you will find any bet among many hundreds in a few seconds. 1xbet offers all kinds of Asian and European handicaps and totals with interval of 0.25. Placing accumulator bets on this site is the right choice! A wide selection of events and markets allows to find any outcome at the best price - what else do you need for successful acca? In addition, the website offers ‘Acca of the day’ with the most popular bets among the site customers, you will get +10% to your winnings placing multiple bets on these outcomes. An acca type, called ‘Stayer’, is especially interesting. This is a new kind of multiple bet invented by 1xbet! It has a huge advantage: few selections can be added to your acca within 60 days, while you can cash-out the amount of initial bet! To say that 1xbet odds are higher than the market average means to say nothing, because they are among the greatest, frequently just beyond competition. If we`re talking about ‘big markets’, like 1X2 on the top leagues, 1xbet can leave behind even Asians bookies. It is easy to prove - just take a look at the odds on any European football league and you will find out that their Payout is 97-99%, which means that the bookmaker’s margin is slightly more than 1-2%! For example, let’s compare 1xbet odds with two bookies for professionals on real English Premier League match. So, 1xbet odds are 2.15 - 3.44 - 3.88, a legendary Asian Sbobet offers 2.09 - 3.10 - 3.70, and the most authoritative bookmaker Pinnacle offers 2.13 - 3.42 - 3.88. As we can see, even recognized leaders are at the same level, or even worse in comparison with 1Xbet. When it comes to ice hockey, the betting margin is higher than on football and reaches 4%, but it is still above the market average, which is about 6-7%. 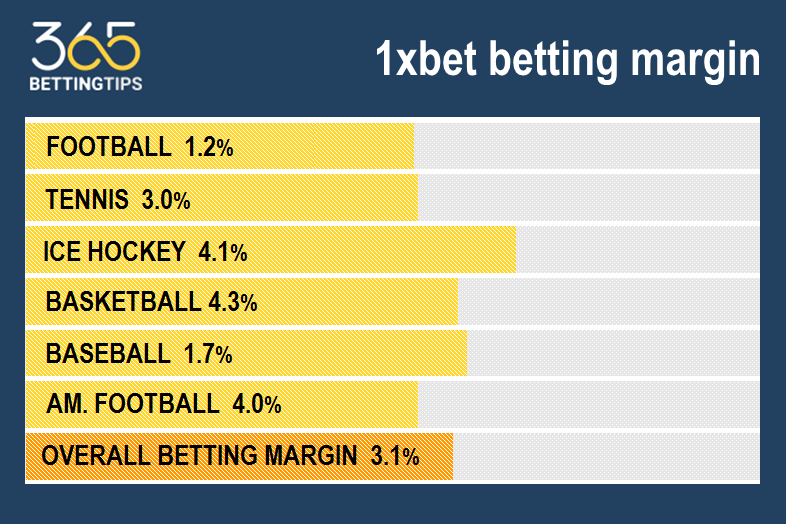 The situation is the same for other sports – 1xbet is still ahead of competitors, as tennis market average margin is 7.5%, while 1xbet has 4.5%. We can safely say that the quality of odds of this bookmaker is among the best in the world! 1xbet offers one of the best In-play live services! Indeed, this is not surprising, considering that this betting site takes the leading position in the pre-event betting markets and odds, so it is natural that we see a strong live section. The number of sports and markets are very extensive and you may count to find any event. The changes of the odds are instant, calculation of the winning bets will take a few seconds - things happen very quickly here. It is important to note that this betting site allows you to combine live bets with pre-event bets in one coupon! There is a curious type of betting which is called ‘1xZone’, where a player is invited to guess what will happen in the next time interval (goal, penalty, corner, etc.). 1xbet offers a great selection of live streaming, although not always of high quality, but you can watch game full screen in a separate window. There is also useful Multi-Live function on the site, when you create multi view on the screen and can watch a few games at the same time - it is very handy! 1Xbet could be a good choice for any type of punter, whether a beginner or an experience player. The minimum bet is only €0,5 which is good for newbies, but betting limits can upset highrollers. Officially, a maximum winning is €500,000 per bet, which is great but it is unlikely to be true. In our experience, this betting site easily accepts bets of up to €5-6 thousands, in other cases everything depends on the popularity of the market and your betting history. So if your normal stake is €10,000 or you like to bet on small markets, then most likely, you better look for another bookmaker. If your bankroll is not more than €50,000, then you can keep enjoy the best odds on this betting site. 1xBet mobile version is very convenient for betting, but using the application is far preferable, since it does not require the user to download interface elements and works faster if compared to the mobile version. The application contains everything you need for a comfortable betting - the player who decides to download 1xBet application will receive full access to the website's functionality: Live and pre-event betting, loyalty program and bonuses, access to all payment methods and support service. Taking into account a large amount of information, the developers have implemented three menus: the main window consists of the side menu showing the coupon, settings, login and registration; menu with live and pre-match betting, slots, fantasy sports, statistics, etc. ; menu with sports. Well-formed information blocks do not require much memory of your device. The betting application works on both phones and tablets. You have to do just a couple of clicks to deposit or withdrawal. There is an opportunity to see the history of yours bets. You can enjoy watching live streaming and place bets during the game. 1xbet mobile application is just an alternative of the website mobile version only faster to load and requiring minimal consumed traffic. You can download the betting app for free on the bookmaker's website; it is enough to be a registered customer. 1xbet app is adapted to all operating systems; you can choose applications for Windows, Android, iOS and Windows phone. The application provides the same options as the betting site. In addition, this app has many useful additional functions, for example, the results of your stakes can be sent to your mail. 1xbet can be an ideal bookmaker for beginners and recreational players, because this betting site offers the largest selection of markets at the highest odds with the fastest withdrawal. Perhaps for professional players and high rollers this bookie can be uncomfortable as sooner or later their accounts can be limited, but this bookmaker is ready to accept large enough amounts without problems, so it will be an excellent choice for a regular bettor. 1Xbet offers round-the-clock support by all known methods. There are few e-mails, depending on the specifics of the question (for general queries: info-en@1xbet.com; security department: security-en@1xbet.com), answers by e-mail will be received within 12 hours, also you can use a feedback form (reply within 24 hours). Free phone +380 80 080 0138 (you can order a call back on the website). The fastest way is an online chat consultant. Sometimes the support service (or security service) can ask to contact you by Skype. In general, players characterize 1xbet Customer support as a fast and high quality. Perhaps 1Xbet cannot yet be ranked among the leaders of the European gambling market, and this is not surprising, because most players prefer British bookmakers with many years of reputation, however, this betting site, though young, but a quickly growing company that will probably find its niche in the betting market very soon. 1Xbet operates under the license issued to Curacao Egaming, Authorized and Regulated by the Government of Curacao, like most other European big and reputable companies, so you do not have to worry about their reliability. Despite its small popularity, you can easily evaluate the quality of services, because you cannot deny the fact that 1Xbet offers the highest odds and the best choice of markets. So, why not to try to bet here? A big name is not always a guarantee of reliability.